I just discovered kombucha a few years ago at a natural products health expo (also known as Expo-West). One of the brands that I sampled was Health-Ade. They quickly became one of my favorite kombucha on the market because they use clean ingredients and minimal sugar. I was super excited when the Feedfeed reached out to me about working with Health-Ade because I already loved their product. 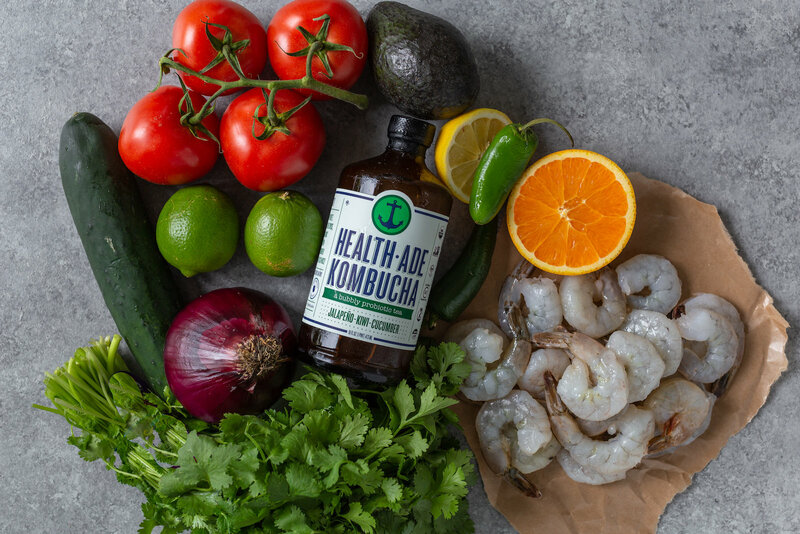 While I drink Health-Ade on a regular basis, I have been experimenting more with using it in cooking. This recipe incorporates Health-Ade's newest flavor, Jalapeño-Kiwi-Cucumber. 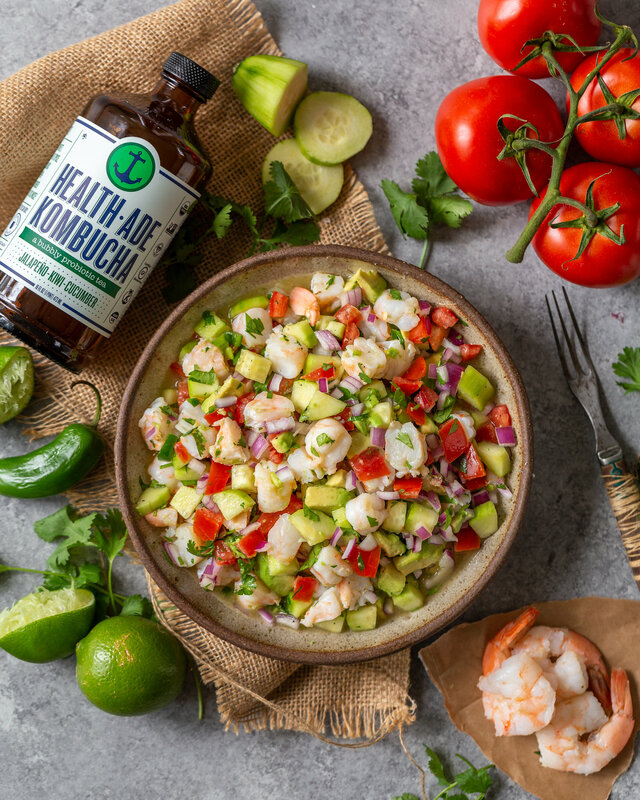 It provides just the right amount of kick for the super fresh shrimp ceviche. Bring a large pot of salted water to a boil, add shrimp, turn off heat, cook for 2 minutes then transfer to an ice bath. 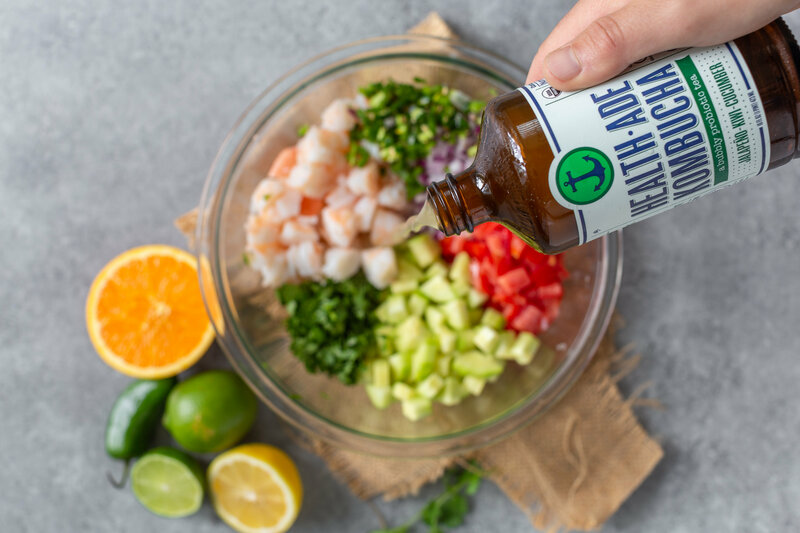 When the shrimp are cooled, cut into 1/2 inch chunks and place into a large bowl with the kombucha, lemon, lime, and orange juices. Stir in cucumber, onion, chili, and a pinch of salt. Refrigerate for 1 hour. Now add tomato, avocado, cilantro, olive oil, pinch of salt and pepper for taste. Allow to sit at room temperature for 30 minutes. Serve with tortilla chips and enjoy!